The struggling company will only be using a mid-range processor this time. If you're one of the few people who are still waiting for the next dual-screen YotaPhone, listen up: we finally have an update for you. During Harbin's China-Russia Expo over the weekend, Baoli Yota -- the joint venture formed by investor Baoli (formerly known as REX) and manufacturer Coolpad -- teased its upcoming "Yota3" with a date: it's due in the early fall later this year (almost four years since the launch of its predecessor) and will come with 64GB or 128GB of storage for a more favorable $350 or $450, respectively, according to RBC. Not much else is said about the device nor its design, but a source revealed to Engadget that there's nothing new nor innovative here: it's merely a new model with bigger screens, yet it's powered by a mid-range Snapdragon 625 chipset -- the same silicon inside the ASUS ZenFone 3, Moto Z Play and BlackBerry KEYone. According to a spec sheet provided to Engadget, the Yota3 packs a much bigger 5.5-inch 1080p AMOLED display on the front and a 5.2-inch 720p E Ink touchscreen on the back, both of which are the least you'd expect after such a long wait. Likewise, you'll find a fingerprint sensor on the front side. It'll also come with Android Nougat, 4GB of RAM, dual SIM slots (one of which also serves as a microSD slot), a 12-megapixel main camera with dual flash, a 13-megapixel front camera, a 3,200mAh battery and a USB-C port which also does audio output (ugh). These specs don't seem bad on paper, but only for now; the Snapdragon 625 will make the Yota 3 look obsolete by the time it launches this fall -- our source indicated some time between October and November. The two previous YotaPhones might have been a bit late to the game, but at least they shipped with flagship chipsets. 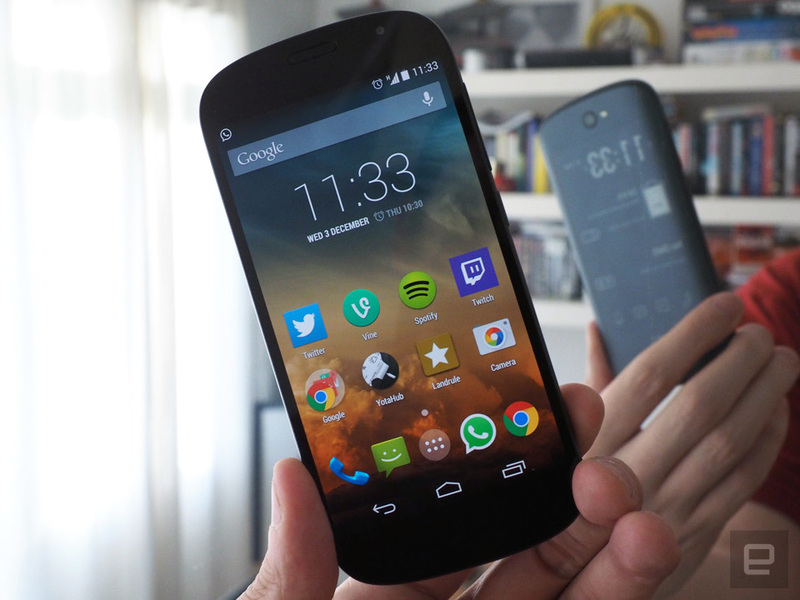 It's been quite a roller coaster ride for the dual-screen YotaPhone series. Back in October 2015, Yota Devices planned to sell 64.9-percent stake to investment company Baoli who was going to enlist ZTE to manufacture the Yota3, but Baoli ended up buying just 30 percent in the following April. This left Telconet with 34.9-percent majority share, Rostec with 25.1 percent and MTH Limited with 10 percent. Despite Baoli having already set up a joint venture with Coolpad (instead of ZTE) later that year, Rostec CEO Sergey Chemezov revealed back in March that Yota3's mass production was held up by Baoli's refusal to allocate the necessary funding. According to our source, Baoli had been making moves to force its Russian comrades out of the operation, so much that Yota Devices' former CEO Vladislav Martynov has allegedly filed a lawsuit against Baoli in the UK. As of July last year, Martynov had already handed the CEO role over to COO Dmitri Moiseyev while remaining on the board, but that didn't seem to work out on Martynov's end, nor is it clear whether Moiseyev is still at Yota Devices. Efforts to reach either men for comment for this article were unsuccessful. At this rate, the future of Yota3 remains uncertain despite its recent teaser in China. It is rather mind-boggling how this Russian-Chinese partnership has managed to drag on for this long in the rapidly changing smartphone market. Even if it manages to deliver the phone, it will be a tough sell with that aging chipset plus an apparent lack of new innovation.